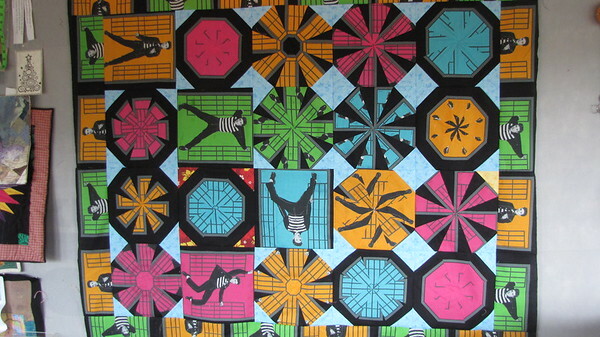 Several years ago the technique of StackNWhack was popular—I had a length of fabric bought at Hancock’s closing sale featuring Elvis in front of prison bars. There were some other fabrics–a wild Hawaiian floral print, and a light blue with Elvis written on it. My friend helped me line up the panels, I cut, and sewing, and combined it with a bright yellow. The resulting quilt was quite colorful and somewhere I have a photo of it. It was used as the grand prize at a Al-Anon convention–and won by the sister-in-law of the friend who was the convention chairman. That sister is somewhat impaired mentally but she was totally thrilled–so much so that I gave her my Elvis T-shirt I bought at Loretta Lynn’s kitchen in Tennessee. So back to the quilt of the day. There were quite a few pieces left over plus some panels. The original had all of Elvis shaking an rolling in a sort of kaleidoscope fashion. The remaining pieces had just a leg or a foot or sometimes just the bars. 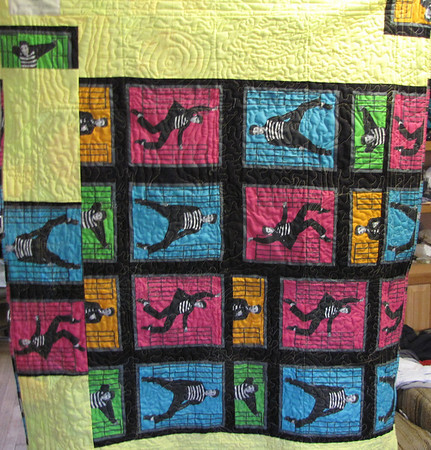 I put them all together, used the remaining panels for the back–and here it is– And ready for the Golden Triangle Quilt Auction–the first time I have donated a quilt of cuddle size. here it is in process on my design board. 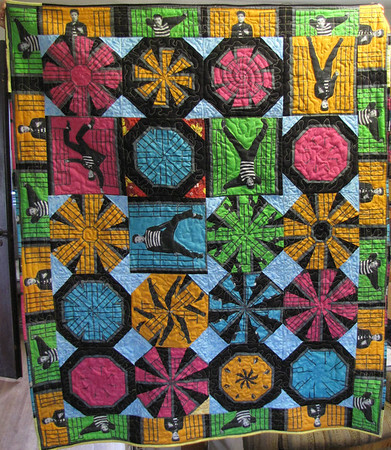 Here is the front quilted, the fingers on the top are my husband’s who was offered the choice of taking the photo or holding it. And here is the back with some of that really bright yellow I used on the first quilt. Now I have none of that fabric left, I don’t have the partially sewn blocks looking at me accusingly from the shelf and hopefully there is another Elvis lover who will fall in love with it. So now I must fish and fumble through the shelves for another partially completed project. I’d like to have those shelves and boxes empty but there is a huge stack waiting to be quilted and my midarm machine is not happy.